The plane or planer is one of the least understood and most ignored woodworking tool in the modern workshop. But to carpenters and cabinetmakers in past generations, it was one of the most dispensable tools they had. One couldn’t pass their apprenticeship and become a journeyman in either of these trades until they not only understood how to use a plane, but had made several of their own. Today, many people try to use sandpaper in the place of a plane, whether by hand or with a variety of power sanders. But while these power sanders can do some excellent work, there are several things a plane does naturally, which are extremely hard to do with a power sander. More than anything, it is hard to ensure a straight edge with any sort of power sander. Thickness planers are shop tools, intended to stay in the workshop and not be used on the jobsite. While some of these can be considered benchtop units, they really aren’t intended to be; but rather to be permanently mounted to a stand for ongoing use. These are the powerhouses of planers, providing the most capacity and the most power to do the best job for you. 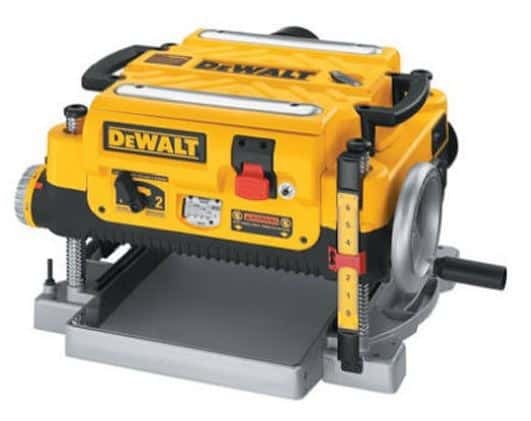 DeWalt has the most popular thickness planer on the market, in the DW735. This is their 2019 model, designed to replace the DW734. The major difference between this unit and the older one, besides more convenient controls, is that this is a two-speed model, which refers to the feed speed, not the cutter head speed. Making the unit two-speed allowing for 96 or 179 cuts per inch, allowing you to reduce scalloping. Changing speeds is quick and easy, with the flip of a lever. This planer allows for depths of cut up to 1/8” thick; although you should make shallower cuts with wider boards. Its 15 amp motor can handle the strain with even the hardest woods. A scale right on the corner post allows you to set your desired final thickness easily. In addition, there is an extra-large turret depth stop, allowing the user to return to the most common thicknesses quickly and easily. The entire 19-3/4” long bed is cast, rather than having a shorter cast bed, with folding end tables. Combined together with the automatic carriage lock, this adds rigidity, helping to reduce snipe. This planer operates at a head speed of 10,000 RPM, providing 30,000 cuts per minute. If you’re looking for a good deal on a thickness planer, WEN has the best deal around. This 3-blade, 13-inch planer will handle just about any board you need and do it at a reasonable price. It runs slightly slower than the DeWalt, at a 25,500 cutting head speed. Coupled with a feed rate of 26 feet per minute, you might see a touch more scalloping, especially compared to the low-speed selection on the DeWalt; but that can be cleaned up with a little sanding. This unit also comes with a 15-amp motor, although the maximum depth of cut is slightly less at 3/32 of an inch. That might mean an extra pass on some projects; but that final pass should be a thin one anyway. An onboard material removal gauge will help you know exactly how much material you are removing on each pass. This unit by Cuteh is a true professional thickness planer. The outstanding thing about it is the spiral cutterhead design, which comes complete from the factory with carbine inserts. Using a spiral cutting pattern reduces scalloping, by making the individual cuts smaller, rather than being the full width of the board. While it will still require finish sanding, the scalloping won’t be as obvious, making it possible to get by with less sanding on non-critical surfaces. Because it comes complete with carbide inserts installed, you won’t need to sharpen or replace the blades as often, getting longer life, before dulling. This unit comes with oversized 14” x 12” infeed and outfeed tables, making it easier for you to feed and retrieve your workpieces. Between the four heavy-duty guide posts, two heavy-duty elevation screws, and “snipe lock” snipe on the boards is kept to a minimum. Although this thickness planer by Makita is intended to be a shop tool, its lighter weight (67 lbs.) makes it possible to use it as a portable planer. Like the Cutech, this one has been designed for use by professionals, as all Makita tools are. Although this planer features a compact design, it has a 12” x 30-3/8” table, including the extensions. That large table, coupled with Makita’s excusive Interna-Lok automated head clamp, help reduce snipe for improved performance and finish. A built in gauge on one of the guide posts helps set the thickness exactly, all the way up to 6-3/32”. Up to 1/8” of material can be removed on each pass. This planer comes with two knives, one less than the WEN unit mentioned above. With a head speed of 8,500 RPM, you will see some scalloping. I decided to add one heavy-duty unit into this list, for those who are looking for something more. This massive shop thickness planer will cut boards up to 20 inches wide. At that width, the 5 HP motor will allow you to cut a maximum material thickness of 3/32 inch; but you can cut deeper at smaller widths. The cutterhead on this planer holds a total of 92 staggered, four-sided knives. It has three steel infeed rollers to make for easier handling with those larger projects. Both the infeed and outfeed tables are cast iron and ground as smooth as glass and perfectly aligned for smooth operation and to avoid marring your project. A two speed gearbox allows you to feed your workpieces at a rate of 24 or 31 feet per minute. While big, this planer still provides for precision, with a large height adjustment wheel and 1/16” increment height adjustment. Cast iron construction ensures stability and long machine life. Most planers can be considered to be benchtop units, as only the largest industrial models ship with stands. So we’re going to see some of our favorites here, which we’ve already looked at. Nevertheless, they deserve mentioning again, because they are some of the best around. The new DeWalt unit stands out from all other electric planers on the market, in that it is a two-speed unit. That doesn’t mean that the cutting head has two speeds, but rather that there’s a two-speed feed rate. You can go fast for rough cutting, then slow it down to get a finer finish, will less scalloping. This is the only unit I’ve seen, other than big commercial ones, which has that feature. That’s not the only feature this planer has, either. It is built with three cutter knives, as opposed to the two that some others have, and the cutter heat runs at 10,000 RPM, giving a maximum depth of cut of 1/8 inch, longer blade life and smoother finishes. An extra-large turret depth stop provides presets for all the most common finished board sizes, from 1/8” up to 1-1/4”. It also has a larger base, at 19-3/4 inches, as big as most others have with the extensions attached; but this one gives you the extensions after that. The DW735X above was made to replace this planer, but this one is still on the market and it looks like DeWalt is planning on keeping it. This gives them the option of two models, one with more features, at a higher price. But, while this one doesn’t have the two-speed feed rate and large bed of the other, it’s nothing to sneeze at. They are using the same cutter head and drive for both units; so you still get a three-blade head, turning at 10,000 RPM, faster than most. That provides for a smoother finish, even without the slow feed rate. Much of the rest of the design is the same as well. Porter-Cable’s benchtop planer looks almost simple, when compared to some of these others. But that’s not to say that it is, just that Porter-Cable has managed to design a planer with smooth, clean lines, eliminating distractions. This is somewhat a hallmark of this manufacturer. Another hallmark is long tool life. The head of this planer is ball-bearing mounted, rather than a sleeve bearing like most use. That pretty- much eliminates the biggest maintenance concern there is with a planer. If you’re looking for one that will give you year of uninterrupted service, take a look at this one. Portable planers are essentially the lighter-weight cousins of the thickness planers I mentioned above. In fact, there was one I mentioned, which can also be used as a portable one. All of these have 15-amp motors, like the majority of the thickness planers mentioned above, so they have similarcutting capability. Even so, their lighter frame and construction means that you probably won’t get as good a finish, as the others offer. On the positive side, they are less expensive. Porter-Cable has developed cutterhead elevation technology that is unique enough that it is patented. The crank handle for controlling the cutter head height (and final material thickness) is designed to fold, making this 64.8 pound planer that much more portable. When you get to the jobsite, the stamped steel infeed and outfeed trays fold down into position, giving you a large bed to work with. Porter-Cable is known for providing high-quality power tools to construction professionals and this unit seems to follow that pattern. Ball bearing design in the drive mechanism helps to ensure long life. This couples with a poly V belt drive with rigged gearbox and chain. The entire drive train has been designed to handle rugged use. It is designed to use two reversible blades, which are reversible, high-carbon steel. This is essentially a lighter weight version of the WEN 6552, weighing in at only 66 pounds. The 15-amp motor drives the three blade cutting head at 25,500 cuts per minute, feeding material at 26 feet per minute. Standard blades are reversible for longer life. An onboard material removal gauge lets you know exactly how much material you’re removing on each pass. And there’s an easy-to-read height gage, with a magnifying lens mounted to one of the support column. Infeed and outfeed tables are stamped steel and foldable for easy transport, making it easy to move this planer to wherever you need it. A fan-assisted dust port removes sawdust and chips, helping to keep your work area clean and keep the chips from blocking up your shop vac’s hose. With a capacity of 13” wide and 6” thick, it’s unlikely you’ll run into boards on a construction site which won’t fit this planer. Powertech comes in with the best value in a portable planer, with this 12-1/2” wide unit. At 63.3 pounds, it’s also one of the lighter ones. It also has carrying handles built in, making it that much easier to move from the truck to the job site. There’s a workpiece return roller to assist you when planning extra long boards. Powertech has developed a unique index pin set-up for easy blade changing. This means there is no need for a blade gauge. Coupled with the standard spindle lock, this is one of the easiest planers to change blades on. Delta Power Tools has quite a following of satisfied users; many of whom buy only their products for larger shop tools. The reason for this is their reputation for quality. Delta’s tools are designed to give you the maximum service life, with little to no hassles. This is the lightest portable planer I’ve seen, at only 58 pounds. It handles materials up to 13” wide and 6” thick, running them past the two, double edged blades. Delta’s engineers designed these to be disposable, rather than resharpening them like many manufacturers do. A feed rate of 28 feet per minute is controlled with nitrile synthetic rollers for positive material control. This planer’s infeed and outfeed tables are adjustable, to help reduce snipe, a feature not common on portable planers. It also has a quick-change knife system, allowing you to change knives without the need for alignment jigs. Hand held planers are the most popular and common out there, mostly because of their small size and lower cost. While they don’t have the capacity of the larger units, they provide plenty of flexibility for the home woodworker with a limited workshop. At the same time, they are popular amongstprofessional carpenters, for the ease of transporting them to their jobsites. What makes the WEN 6530 so amazing is its price. This is, by far, the lowest-priced planer on the market. Yet it still provides a 3-1/4” cut width and has a six-amp motor. Depth adjustment is set with 16 positive stops, providing as little as 1-128” of cut, all the way up to 1/8”. With two blades and a 17,000 RPM cutting head speed, it provides over 34,000 cuts per minute. The base shoe has a V-groove in it, excellent for use in planning a flat surface on post corners. Even with this low price, the WEN planer comes as a kit, complete with a dust bag, rabbeting guide, kickstand and parallel fence bracket. The rabbeting guide adjusts from 0 to 1 inch, allowing rabbets up to 1 inch in depth. With the parallel fence you can be assured of an accurate, straight cut, and the kickstand protects the workpiece’s surface when setting the planer down. WEN also makes similar models with a 2-3/8” and 4-3/8” width of cut. Porter-Cable’s PC60THP handheld power planer is another inexpensive option to choose from. However, there are a number of major differences between this unit and the WEN one. Those differences come from a difference in intent between the two units. Whereas the WEN unit is built for fast material removal in softwoods, the Porter Cable is designed specifically for use with dense hardwoods. This is most clearly demonstrated through a smaller maximum depth of cut, which on this tool is limited to 5/64”. The depth of cut knob is rubber overmolded for comfort, as it also serves as the front handle for the unit. It is clearly labeled for 10 depth settings, as well as 3 different chamfering grooves. The 11.5” cast aluminum shoe provides excellent control and helps to maintain a superior finish quality. The planer comes complete with a wrench for changing the blades, dust bag, edge guide and a kit bag. Bosch’s entry into this list is the first truly ambidextrous handheld power planer on the market. Not only does it have dual dust ports to attach a vacuum to and allow the fence to be mounted to either side, but there are both lock-off and lock-on buttons that can be accessed from either side of the tool. This one’s a bit more powerful, with a 6.5 amp motor. That extra half an amp may not sound like much, but it’s a 7% increase in overall power, so that’s significant. Bosch has put a lot of important details into this planer as well, in addition to the ambidextrous controls. There’s a built-in, spring-loaded stand to elevate the tool off the workpiece and protect it from damage. At the same time, it’s possible to start your cut in the middle of a workpiece, something that not all power planes can do. There’s also a plastic overshoe for the fence, to prevent marring the workpiece, and a ball-joint swivel on the power cord. One final important thing about this plane is that the twin blades can be easily replaced with high-speed steel blades for better cutting action. With a 3/32” maximum depth and machined shoe, this plane will leave you with a well-finished workpiece. DeWalt takes it up a step more, building this plane with a 7-amp motor. That’s a full 16% more power than the WEN we looked at first. This may not make much of a difference if you’re doing shallow cuts on fairly soft woods, but when it comes to the dense hardwoods, you’ll be glad to have that extra power. Couple that with carbide blades (an option) and you’ll have a real workhorse, perfect if you have to do a lot of planning. The precision machined shoe is also precision ground on the sides, making this plane ideal for use with rabbeting cuts. The shoe has three precision-ground groves, allowing three different sizes of edge chamfering. While the cutter head moves at a slightly lower speed (15,000 RPM), and the maximum depth of cut is 3/32”, it is clear that this tool was designed for rough usage. Ergonomic controls make it easy to work with. The plane comes with a rabbeting fence and kit box. This list wouldn’t be complete without something from Makita, who makes more handheld power planer models than anyone. I’ve selected this 6-3/4” wide model because it is so unique; cutting a swath more than twice the width of the other models we’ve looked at. This is the planer to look for, if you need to do more than the other models can do. The 10.9 amp motor provides sufficient power for that wider blade, allowing you to cut even hardwoods in a snap. With the cutting head rotating at 15,000 RPM, it makes 30,000 cuts per minute, providing a smooth finish with minimal scalloping. The machined aluminum shoe is matched by a machined aluminum fence and guide. Everything is packed together in a wooden tool case. There really aren’t many companies that produce a jointer-planer combination, but if you’re limited on shop space, this combination tool gives you the ability to have both tools in one. Since the two tools perform different, but related tasks, you really need them both for fine woodworking projects, especially tabletops and carcases. The jointer is used predominantly on the edges of the board, preparing them for jointing, or gluing together to make a large board, such as a tabletop. The planer cuts the front and back surfaces, flattening and smoothing them, while ensuring that they are exactly parallel. Together, they make for a critical combination for fine woodworking. Jet produces more models of jointer-planer combinations than anyone else on the market. This 10-inch unit is there mid-range unit, providing incredibly good value in a combination unit. Since most projects are made of boards that are 10 inches or narrower, most of us wouldn’t miss the extra two inches of a larger unit. While smaller than the Grizzly unit below, this planer is no slouch. Its cutterhead provides 18,000 cuts per minute at a maximum depth of 1/8”. The table is precision ground and the fence is extruded, providing an absolutely straight surface. A 13-amp motor provides sufficient power for any project you’re likely to undertake. Even though this is technically a benchtop unit, the jointer-planer comes with a stand, allowing you to use it as a stand-alone, freeing up benchtop space. Grizzly’s contender for a jointer-planer combo is also a 10-inch unit. The major difference between this unit and the Jet unit is that this is a true industrial model, and it shows. Everything from the fence extrusion to the precision ground cast-iron tables is heavy duty. One especially nice place where this shows up is in the controls, which are oversized and easy to use. This jointer-planer uses a European-style blade guard for the jointer, unlike the Jet, which uses the more common “porkchop” style. Both work well but some people think that the European design provides better protection. Changeover from jointer to planer modes is extremely easy and quick, so you don’t need to worry about ensuring that you finish everything in one mode, before switching over to the other. This unit comes with a 2-1/2 HP motor, making it the most powerful in this class. However, it is wired for 220 volt which may make it impractical in some workshops. Rikon comes in with another 10-inch contender at a lower price than the Grizzly unit. The jointer tables are cast aluminum in this case, making them lighter than the Grizzly. Its 1.5 HP motor is a bit slower than the other units though, which will affect the surface finish. They provide three knives on the cutter head, to help make up for it, but there are other units around which still provide more cuts per minute. This unit beats out the Grizzly for weight though, coming in considerably lighter. So if you need a combination unit which can be moved around, you’re much better off looking at the Ricon. If we’re talking just planers, the DeWalt DW-735X is clearly the best one on the market today. The two-speed feed rate, coupled with the higher drum head and three knives, provides the smoothest finish of any planer, reducing the need for sanding and other preparation, prior to assembly and finishing. There are several contenders for best budget planer for the money, but the Powertech PL1215 beats the rest. Providing excellent quality and all the necessary features, they still come in at the best possible price. There are a number of different types of planers on the market, but they all share a few things in common. More than anything, what defines these tools is the way that they cut material. All have a rotating drum, with two or more blades on it. This allows them to remove material from the edge or side of a board, thinning it and straightening the edge. Planers usually have infeed and outfeed tables, allowing you to set a precise depth of cut. Their high speed, allows them to leave a clean, smooth edge. However, on close examination, that edge is slightly scalloped by the cutting process. Nevertheless, it is smooth enough to allow gluing edges together to make a larger board. Handheld planers are most often used by building contractors, for use on construction sites. In order to make them portable, they are considerably smaller than other planers, with a narrower cut and smaller motor; most handheld power planers have a 3-1/4” width of cut. The smaller motor also results in a thinner depth of cut. However, these drawbacks are made up for by their ease of use, especially when having to work on pieces which are already in place. These are usually pedestal-mounted stationary units, designed to be installed and used in a workshop. Their main purpose is cutting boards to the same thickness, so that they can be laminated together to make tabletops and wide panels, such as for the carcase of a chest of drawers. It is almost impossible to do this sort of work, without a thickness planer. These are most commonly used for adjusting the thickness of boards which may not be consistent, by making the two surfaces parallel. This allows them to also be used for thinning boards so that they can be laminated together. Most planers in home workshops would be benchtop units, designed to give maximum capacity, while taking up a minimum amount of space. It is typical for them to have a 12” or more cutting head, allowing you to use them for all standard board sizes. These are similar to benchtop planers, although they are usually smaller, and might have a narrower capacity. But the biggest difference is that they are made to be lighter weight, so that they are easier to carry along to a jobsite. While some might have a smaller capacity (width) or smaller motor, the usual way of making them lighter is a lighter-weight frame. This can affect the rigidity of the planer, which is important to prevent chatter. The solution is to make a lighter cut on wide or especially dense materials. Jointer-planers combine the function of a jointer and a planer. This allows you to work equally well on the sides or edges of a board. They are much more versatile than other planers, taking up less space in a workshop, while allowing you the most flexibility in your work. Since the purpose of the planer is to cut wood, specifically to make it thinner across its entire width, then the most important features are those which will help it to do this the most effectively, providing the best possible finish. Unlike manual handheld planes, wood that has been machined with power planers usually has to be sanded, before finishing. This is mostly to eliminate scalloping. Number of blades – The more blades the planer has, the smaller each cut will be, reducing the scalloping. Most power planers have two blades, but there are some handheld units which only have one, as well as some larger shop units that will have three or even four. Speed of the cutting head – The faster the cutting head rotates, the more cuts it will make in the workpiece, for the same distance traveled. Diameter of the cutting head – A larger diameter cutting head will make each cut less of a scallop and closer to being a flat cut. Even so, this is the least important characteristic that affects scalloping. Material feed speed – The faster the material is fed through the planer, the longer and more pronounced the scallops will be. Most planers either have an automatic feed or a hand-crank one, but handheld planers are controlled totally by the tool’s operator. Snipe is caused by the way the material is fed into the planer. Ideally, it needs to be flat against the bed and needs to feed at a consistent rate. However, it is unusual for the operator to lay the material perfectly onto the bed and start the feed at a consistent rate. So, there will often be a dip in the surface of the material, at the beginning of the cut. This is the snipe. While snipe is largely a result of the operator and not the tool, planers with a longer bed make it easier for the operator to lay the material flat on the bed at the beginning of the cut, thereby reducing the snipe. Planers with automatic feeders are also helpful in this regard, as they leave both hands free to feed the board into the planer. The other major feature that is important when looking at power planers is the amount of power it has; in other words, how big a motor the unit is made with. This is normally expressed in the amperage of the motor, rather than its horsepower. The more amperage it draws, the more horsepower it has. Horsepower affects two things in a planer: the consistency of the cut and the maximum possible depth of cut. Making a 12-inch wide cut through a piece of wood requires a lot of power, so units with lower power ratings may bog down, especially when cutting through dense hardwoods. Therefore, if you are planning on working with a lot of dense hardwoods, you want to make sure you buy a planer with the most powerful motor possible. The type of planer you choose to buy will determine the maximum width of board you can pass through the planer. This has to be a factor in your buying decision, even though there is no way of knowing everything you’re going to need that planer for, ahead of time. You’re best buying a bit oversize, if you can, just to make sure your planer will accommodate future projects. The real challenge in buying a planer is deciding what sort you really need. More than anything that depends on the types of projects you are planning on doing. Each of the categories above are best suited for a particular purpose, whether on a remote jobsite, as a stationary unit for mass production or a benchtop unit that is only brought out when needed. The type of work you do will determine which is best. All of the planers we’ve looked at are high quality units, designed and built for rough service by professionals. Any of them should provide years of service, whether you are a professional cabinetmaker or need one for your home workshop.